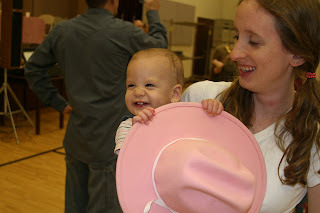 We had a root-tootin good ol' time at the "Ho-Down"(as Ella kept calling it) last night! 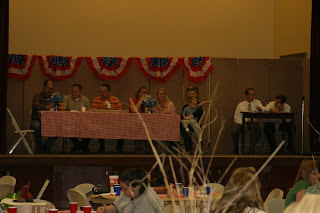 There was lots of yummy chili, homemade cornbread, salads and desserts. 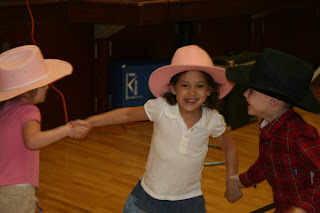 There was even a real square dance caller there to teach square dancing and line dancing. 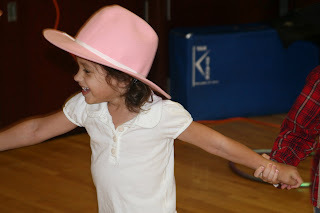 The kids loved doing the "Hokey Pokey" and the "Chicken Dance" the most. And of course, they loved all of the desserts. 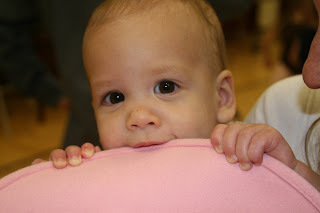 A massive amount of sugar is always a must-have at church events:) Here are some of the pictures from the night. . .
How fun! Love the hair!!! You look like Ellie Mae or whatever the hottie's name was from the Beverly Hillbillies. Also I have to admit, when I saw the title for your previous post, I was thinking "I can't believe Holly is getting so personal about her and Joey's romantic life". I was thinking I was going to have to have a stern talk with you before you started posting details...or pictures. I love Kim's comment, we certainly don't want any of that!!! 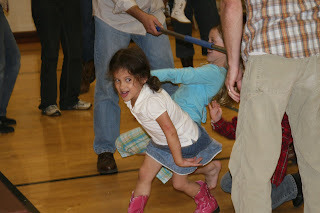 lol Looks like Ella really enjoyed the "Ho-down". Good times!!! That was such a fun evening! Dax and Ella were so cute dancing together. To bad I didn't win the trophy. I had a place on my mantel all picked out! :) Love the picture of you and your girls. that looks like a rockin' par-tee!!! 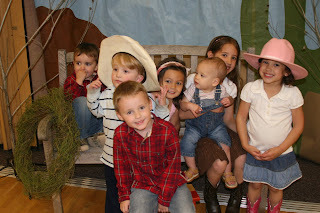 What a great Hoedown! Great job on planing and seriously awesome trophy. 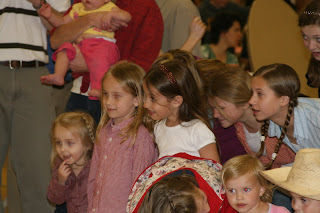 I loved watching the kids dancing! Good times! We actually had the Hokey Pokey ... on a 45. For all you youngsters out there that's a vinyl record spinning at 45 rpm playing on a record player. This was probably around 1960 so kids have been shakin' it to the Hokey Pokey for quite awhile. Looks like fun! Your trophy is darling, what a fun idea! Your family is SO cute! Love the hats and the Hokey Pokey and all that good stuff. 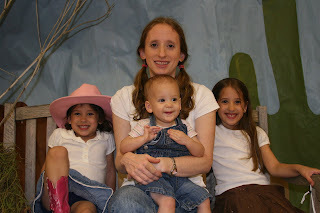 Oh I miss our little cowgirls!! I hope we get to see you all for Elliot's birthday! We love and miss you all very much! What a darling family and what a fun ward activity! I want to dance just looking at the pictures. You guys are just too cute. Okay, your sure know how to throw a party! It looks like a lot of work. You are one creative girl! Yee-haw!! Looks like a rootin' tootin' good time!...esp. with the chili! hee-hee! Fun times, your girls are so fetchin cute! Yee-haw!